Our ice cream van, vintage parlour and vintage trike come stocked with a choice of Marshfield handmade real dairy ice cream and quality fruit sorbets free from artificial colourings, flavourings or additives, suitable for vegetarians and gluten free. Diabetic ice cream is also available. We like to offer classic ice cream flavours with the option to include more unusual flavours. 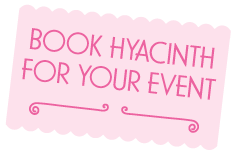 To hire Hyacinth for a heavenly ice cream experience we can build a tailor made package designed for you. Here is a selection of our range of ice cream and sorbets. For full range please enquire.